A local dental equipment company has donated more than $20,000 worth of equipment to increase access to affordable dental care. 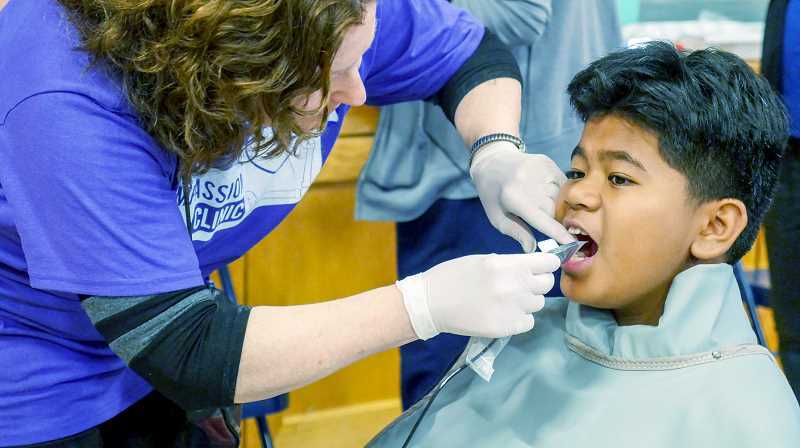 DCI, a family-owned and Newberg-based dental equipment supplier, donated the custom-made dental equipment to Compassion Connect, a nonprofit organization that works with churches to provide free health clinics in the greater Portland area. All told, DCI donated 26 dental units, which were used at a free health clinic in Tualatin on Oct. 20. Held at the Tualatin Elementary School, the clinic served about 200 people. The clinic was staffed by local volunteers, usually local dentists and doctors. Ray Biggerstaff, Compassion Connect's clinics director, said the donation was an important step for the nonprofit, adding that DCI is an important partner who has worked with the organization in the past, mostly to help fix broken equipment. This new donation was of all new equipment, including X-ray machines, hygiene equipment and tools to install fillings. "They have been a great partner," he said. "It's a very generous donation. To have brand new equipment in this setting is a wonderful thing for us." In addition to the dental equipment, DCI also plans to donate new dental chairs by the end of the year. Biggerstaff said while past donations to help fix aging equipment is always helpful, this new donation by DCI helps position them to help more people in the future. He added that the group offers mobile clinics in more than two dozen communities in the greater Portland area, including at the recent Tualatin event. They bring trailers full of the equipment to a community center, usually a school gymnasium on a weekend, and offer the free clinics for a few hours. Biggerstaff said the organization is very grass roots and word that they are coming to a town is usually spread through referrals or through fliers in the places they are going to be offering a clinic. He said schools and grocery stores are good places for fliers. But also the schools themselves often know which students have the families most in need, and refer them. "Access to health care is an issue in every community," he said.